If you want an e cigarette to fit perfectly into your life style than the smok osub 40w kit is sure to make its way into your pocket! This compact mod is the perfect size to carry around, it’s light weight and easy to use. The Smok osub mini has a unique design in which the power button/firing button is a giant magnet. Yes, you heard me right! The OSUB mod features a magnetic cover on its side that can be held down to vape, and then removed to have access to its micro-usb charging port. 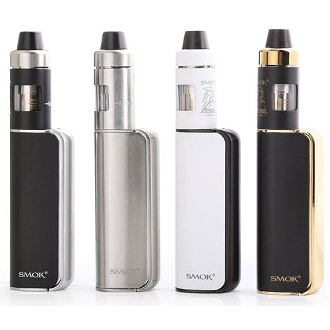 It does have a 2 Amp charging which means its charge time is very fast and also includes a built in 1350 mAh battery for a classic all day vape. The front of the Smok osub Mod displays your OLED screen with a clear and easy to ready look, along with your function buttons. To change your output wattage/ voltage simply press the up or down buttons to your preferred setting. Paired with Smok osub Mod is the very classy looking Helmet Mini Tank. It has a wide-bore Delrin Drip Tip for lots of air flow and a comfortable O shaped mouth feel. It is a top fill Tank where you must press and twist the top to disassemble and fill up its 2ml body capacity. There are two coils that come with this kit: 0.4 Ohm and 1.0 Ohm. The 0.4 Ohm will give you a direct lung hit with luscious clouds of vapor, while the 1.0 Ohm will give the user a mouth to lung vaping experience, which new users find easier to grasp.